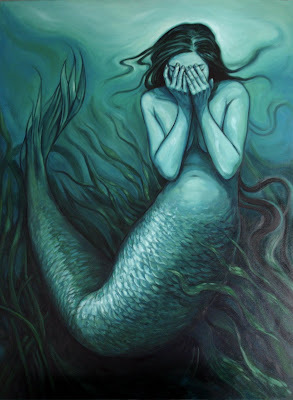 I'm guessing that for you, life may seem a colorless and shopworn thing, because you have not yet discovered the World of Kelly Vivanco. I've hesitated to write about Kelly because her work means so much to me, and I certainly won't be able to do justice to it. With that caveat, here I go... Kelly grew up in suburban SoCal and now paints (and draws cartoon rodents) in North County San Diego. She is a studio artist at Distinction Gallery in Escondido, and she will be part of an upcoming show at Thinkspace called "Uncommon Gardens" that opens on May 9, 2008. 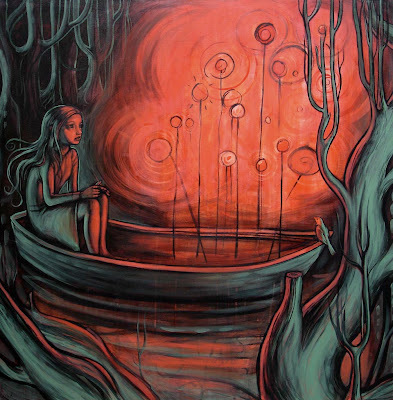 Once upon a time, I happened across one of Kelly's paintings at Thinkspace, and I just couldn't stop looking at it. It was beautiful, mysterious, and slightly surreal. The colors were otherworldly and the technique was masterful. It combined the classical qualities of a turn-of-the century fairy tale illustration with an environment reminiscent of ruins on a distant planet. To me, this combination was utterly delicious, so although I had come to Thinkspace to check out something else, I couldn't leave without buying "Alcove." As it happened, that purchase kicked my art addiction into a new gear, and by the end of the year, I had a house full of Kelly's work. 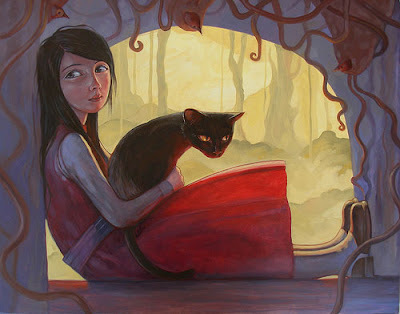 Unlike many artists you'll encounter these days, Kelly Vivanco doesn't have a narrow specialty – she paints portraits, tableaux and scenarios; women, children and animals; fantasies, dreams and enigmas. Emotionally, she covers a wide territory – whimsy and silliness, wonder and longing, apprehension and daring, sauciness and pride. Though her technique varies quite a bit from piece to piece, her work is distinctive and instantly identifiable. In a recent interview with the webzine Creep Machine, Kelly spoke about how her style came together. "I used to think my work looked a bit schizophrenic. It took an effort to eventually congeal. I am inspired by old photos, vintage things, quirkiness, decay, animals, colors and moods… if that makes sense. I try to get a certain feeling going in the look and atmosphere of a painting." In many of Kelly's paintings, it is the eyes that grab you first – they are liquid pools of emotion that lend a storyline to even the simplest portrait. Looking into the eyes of the heroine in "Her Favorite Red," one can't help but conjure up explanations for such naked expression. Creating images is an intuitive sort of experience for Kelly. Though she takes inspiration from children's books and vintage photographs, the animal world and dream imagery, she doesn't seem to be entirely sure where the scenes she paints arise from. 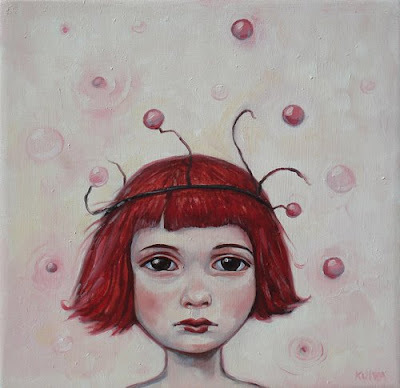 Kelly's "Constellation" is a piece that always elicits a strong response from those who view it. From the moment I first saw the painting, I felt an affinity with it. I immediately recognized in it the surreal logic of dreams, and I am always on the lookout for dream paintings that resonate on my frequency. It also reminded me of one of Sir John Tenniel's illustrations for Through the Looking-Glass, yet when I mentioned it to Kelly, she said she didn't remember that drawing from the book. "New Growth" is another dark, enigmatic piece that is part of Kelly's "Dispatch from the Peppermint Forest" series. The nestlike swirling grass is mesmerizing, the light effects are amazing, and the scene is so mysterious that it invites endless speculation. One can't help imagining what sort of strange, harshly lit underworld the peppermint seedling is emerging from. This painting hangs next to my bed, so it's the last thing I see as I turn out the light. I enjoy interesting dreams! One of the most impressive aspects of Kelly's work is the quality and variety of expression in her subjects. "Sky" instantly brings to mind speculations about the person who has left this young aviatrix behind, seemingly having flown away, probably in a biplane. I speculate that he is heading to a dangerous place and will be gone for some time, because she looks rather worried and wistful already. Kelly says she based this face on a sculpture she saw in the Victoria and Albert Museum in London, and the comparison is striking. I have always been intrigued by this young woman's bold attitude and eye for adventure. She is clearly ready to take on all comers, as they say. I think she may be undertaking an arctic expedition to retrieve a mysterious alien artifact. 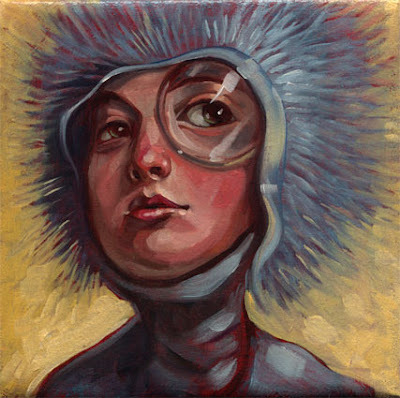 "Lens with the Fur Hood" is the sort of painting I want to look at every morning as I'm leaving the house, just to put the right face on the day. 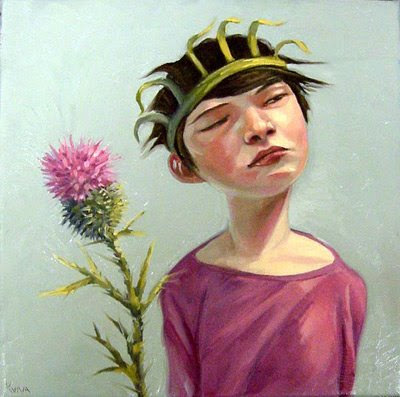 The headstrong tomboy in "Thistle" is a recurring character in Kelly's work, a phenomenon I have noted in many of her paintings. ...and kept having the nagging feeling this girl seemed rather familiar. Eventually, I decided that she must be an older version of the girl in "Pink Molecules." 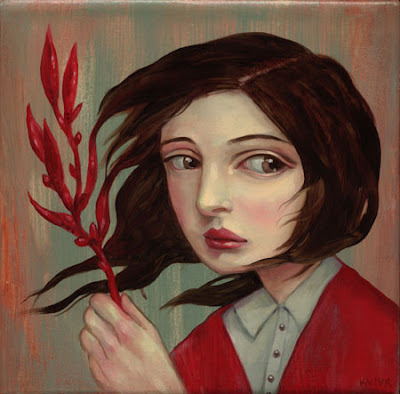 I'll let Kelly Vivanco finish off this little survey of my appreciation of her paintings with a philosophical statement that may shed some light on what makes her work is so fresh and intriguing. "Do it for yourself. If you draw or paint to please other people, you will always be dissatisfied and unsure. One can never really know what anyone else will think. If you do it for yourself, and avoid the fear of ‘looking stupid’ or ‘doing it wrong’ you will get lost in the process and then the amazing stuff happens." Kelly's work is enigmatic. Like the detailed imagery your own mind creates while reading a great book, Kelly's paintings invoke story lines and richly described characters. In fact it is almost impossible to look at one of her paintings and not have a fully realized novel (with full movie rights) just pop straight into your head. 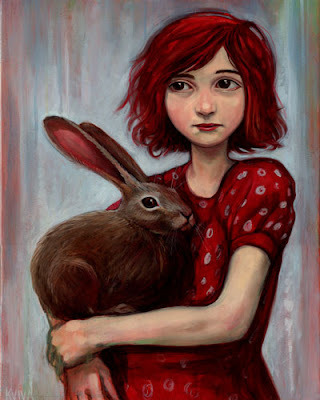 I was checking out a studio at Distinction gallery that was for rent with an artist friend last week and can't stop thinking about Kelly Vivanco. Out of all the artists there, I wanted to just sit in her studio and look at her paintings for hours on end. From the green antique dresser to the painting of three red birds haning on the wall to just the way the wall itself was painted, I felt very at home and very captivated. I have been to museums all over the world and have never been affected by an artist like this!